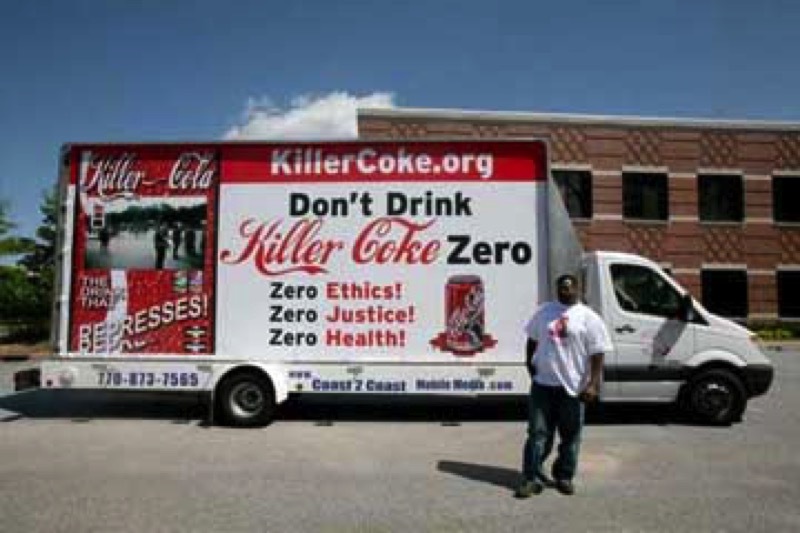 There is no health in Coca-Cola beverages regarding human rights, the environment or your health! Coca-Cola remains under fire for producing unhealthy products that are fueling the obesity and diabetes epidemic throughout the world because of the high sugar and caloric content. Phosphoric Acid in Coca-Cola and Diet Coke has been shown to destroy bones by contributing to osteoporosis and destroying teeth. Aspartame, now known as AminoSweet, has been linked to numerous diseases and health problems. In addition, there are food dyes and other chemical additives in Coke products that are known carcinogens. Due to the mass marketing and consumption of Coke products, millions are addicted to these products due to the caffeine, sugar and aspartame. Coke is also guilty of marketing some products as "healthy" such as VitaminWater and Evigna. Experts consider these claims as false advertising and there are current lawsuits against Coke because of their VitaminWater advertising. In the United States, because of public pressure, Coca-Cola has had to less aggressively market their products to children. However, around the world, the company continues to push their products to addict children where that pressure does not exist. To Coke executives and board members, profits take precedence over morality, ethics and the well-being of children. Like the cigarette companies, Coke circumvents attempts to protect young people whose health is jeopardized by these products. Perhaps there should be a warning similar to the one on cigarette packages: "Coke Products May Be Hazardous To Your Health." An excellent article, Anna Janek! These kinds of beverages used to be the staple of my diet until I was so gutter crawling sick that I had to change my lifestyle. I was literally dying from the inside out. I am new to Nsearch and this is the first blog post I came across. This information pleases me immensely. Thank you! Hello! Fetuses! Did you forget that one?